The Camera Shutter birdhouse resembles the shutter lens of a camera. Made from salvaged cedar, the birdhouse has a teak oil finish allowing the natural colors to compliment the storm cloud blue or dark grey exterior. The birdhouse A Room With a View is made from reclaimed cedar planks in multiple shades to create a unique front that’s made even more unique by the gap left between two sections that creates a little look out. The Flying Dutchman birdhouse also features cedar planks in various tones and an entrance in the upper corner. The sloped roof of this birdhouse floats above the entrance hole to break up the design and better ventilate the interior of the house. 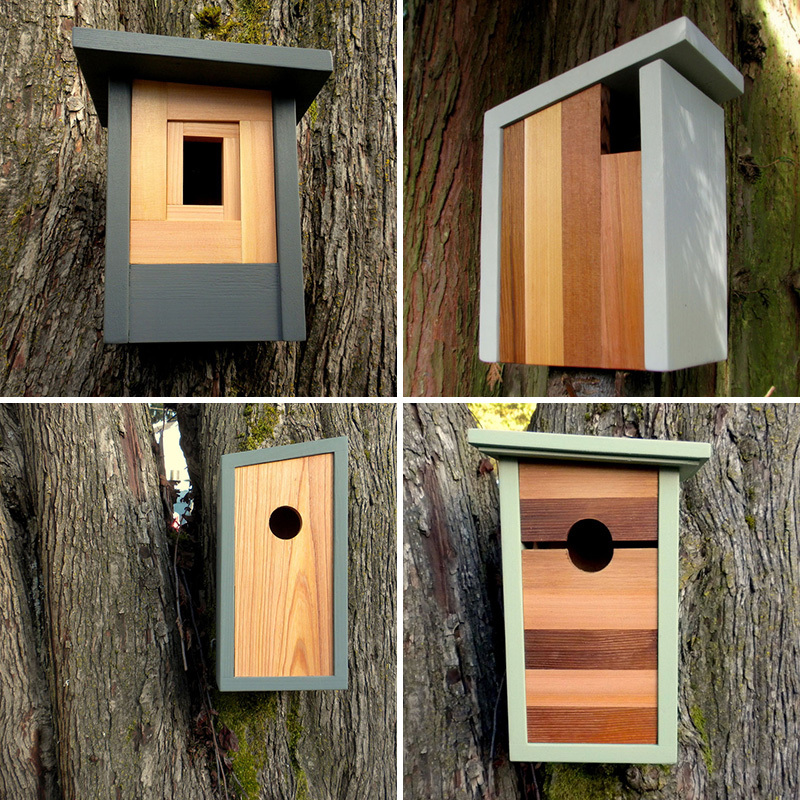 The minimalist design of the Bird Box features cedar, while the location of the central entrance hole below the overhanging roof helps protect the interior from harsh weather and makes it more comfortable on bright sunny days. The Obtuse Birdhouse is a simple geometric home with a circular entry hole. The light cedar wood on the front of the house, stained with teak oil, contrasts the solid colored stain around it and gives the birdhouse a modern, minimalist look. Mind the Gap, features slightly sloped roof together with a narrow opening on either side of the entry hole to provide a little lookout. 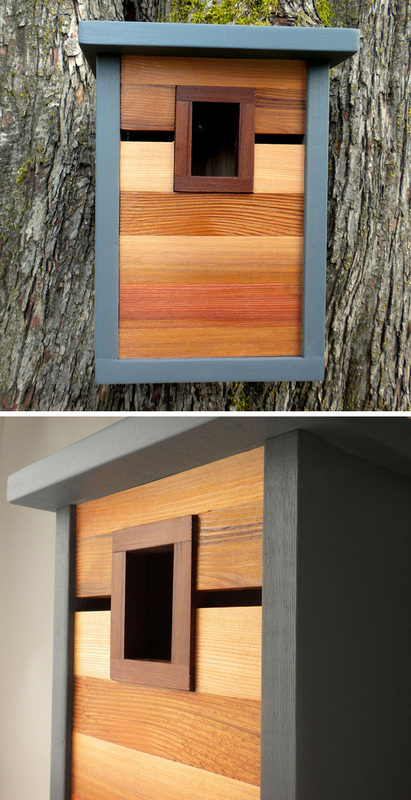 This modern birdhouse, the Right Angle, got its name from the perfect 90 degree angle created by reclaimed cedar connected at the corner of the house. The roof and side provide protection from harsh weather and the small circular entry hole keeps smaller birds out of the reach to other big birds or predators.